Description: This is a shrub about 4-16' tall that branches occasionally. The lower stems are woody; the gray bark is relatively smooth with scattered small lenticels. The upper stems are dull light green and pubescent. The alternate leaves are about ½–1½' long and odd-pinnate with 11-35 leaflets; they have relatively short petioles up to 2" long. Both the petioles and central stalks of the leaves are light gray-green and pubescent. Individual leaflets are 1-2" long and ½–1" across; they are dull gray-green, oblong to broadly oblong, smooth along their margins, and sparsely canescent-pubescent. From the leaflet undersides, scattered translucent glands are visible that resemble small dots. Each leaflet has a tiny pointed tip. The petiolules of the leaflets are slender and short. Occasionally, clusters of 1-6 spike-like racemes of flowers develop from the upper branches. Individual racemes are erect to ascending, 3-8" long, and cylindrical in shape from the dense arrangement of flowers. Each flower is ¼" long (or a little more) and tubular in shape from a single violet-purple petal (the standard) that wraps around the reproductive organs; there is a single style and about 10 stamens that are strongly exerted. The anthers of the stamens are bright orange-yellow. The blooming period occurs from late spring to early summer and lasts about 2-3 weeks. The flowers are replaced by small seedpods about ¼" long (or a little more) that each contain 1-2 seeds. The seedpods are obovoid and somewhat flattened, terminating in short beaks; their outer surfaces are glandular-punctate. The root system is woody and branching. Sometimes small colonies of plants develop at favorable sites. Cultivation: The preference is full or partial sun and wet to moist conditions. False Indigo adapts to different kinds of soil, tolerating occasional flooding. With the assistance of symbiotic bacteria, it fixes nitrogen in the ground. Range & Habitat: The native False Indigo is occasional throughout Illinois (see Distribution Map). Habitats include riverbanks, soggy thickets, open bottomland woodlands, edges of marshland, and wet prairies along rivers. 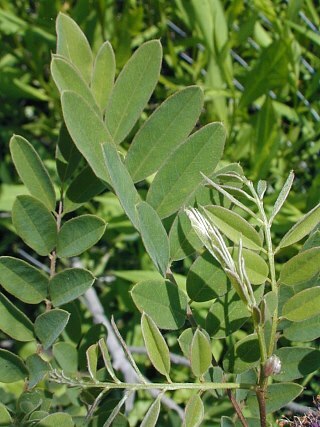 It is likely that populations of this shrub have been declining because of habitat destruction. Faunal Associations: The flowers are pollinated primarily by small to medium-sized bees, which seek nectar and pollen. These bee visitors include Halictid bees (Lasioglossum spp. ), masked bees (Hylaeus spp. ), Andrenid bees (Andrena spp. ), little carpenter bees (Ceratina spp. ), and cuckoo bees (Nomada spp., Coelioxys spp.). The Andrenid bee, Andrena quintilis, is a specialist pollinator (oligolege) of Amorpha spp., including False Indigo. The caterpillars of Epargyreus clarus (Silver-spotted Skipper), the butterfly Colias cesonia (Dogface Sulfur), and the moth Dasylophia anguina (Black-spotted Prominent) feed on foliage of False Indigo, while caterpillars of the moth Pleuroprucha insulsaria (Common Tan Wave) feed on the flowers. Other insects that feed on this shrub include the lace bug Gargaphia amorphae, the plant bugs Psallus amorphae and Lopidea hesperus, and branch-boring larvae of the long-horned beetle Megacyllene decora. There are also several leaf beetles that feed on the leaves (Anomoea flavokansiensis, Anomoea laticlavia, Odontota dorsalis, Phyllecthris dorsalis, and Sumitrosis rosea). White-tailed Deer browse on this shrub sparingly. Photographic Location: Edge of a marsh at Judge Webber Park in Urbana, Illinois. Comments: False Indigo looks like a Leadplant (Amorpha canescens) on steroids. It is taller than the latter shrub and its leaflets are larger in size. In southern Illinois and other southern regions, there is some variability in the size, shape, and hairiness of the leaflets. As a result, different varieties of False Indigo have been described, but most of them are rare in Illinois; only the typical variety is occasional throughout the state. Another shrub with a similar appearance, Amorpha nitens (Shiny False Indigo), has shiny leaflets that are hairless (or nearly so). This rare shrub can be found in southern Illinois, but it is absent from the rest of the state. 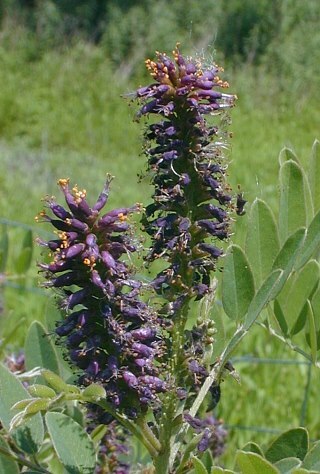 Other common names of Amorpha fruticosa are Indigo Bush and River Locust.